Half cat discovered October 17, 2005, San Antonio, Texas. Image provided to Earthfiles by resident, Robert Casell. Updated October 30, 2005 San Antonio, Texas - Back in October 1999 in Fort Worth, Texas, five mutilated cats were discovered. The strange deaths included half cats, a cat that had been skinned, and another that had its tail sliced in two halves down its length. Also in October 1999, bloodlessly decapitated and half cats were found in San Jose, California; London, England; and Toronto, Canada. 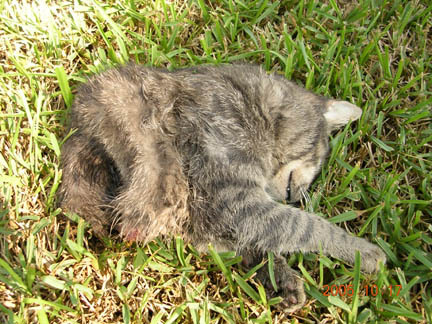 Other 1999 cases involved excisions of paws and/or back leg from cats in Tucson, Arizona occurred in March and June.